Something like five years ago I obtained (I think it was a Christmas gift?) Walther’s “Al’s Victory Service” kit. I remember putting the walls together and then cutting the whole thing apart to rearrange it before putting it back together the way it was originally, then doing some very basic weathering before getting distracted. 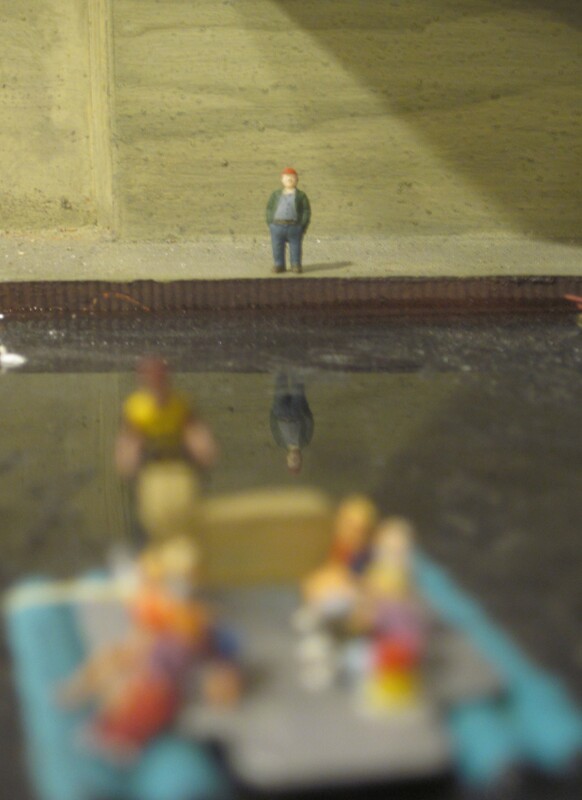 The unfinished structure bounced around the workbench and the layout for the last half decade and – uncharacteristically for me – the rest of the pieces remained safely in the box and tucked away in a spot I actually remembered. Recently I had some downtime and finally finished this little project. 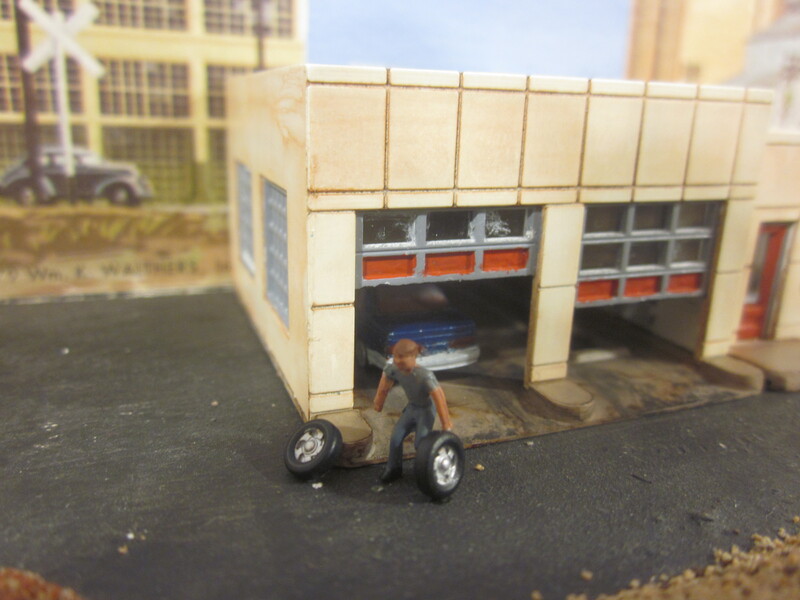 I am particularly proud of my little “live bait” and soft drink signs, the mechanic rolling out a set of tires, and the yuppie with the Porsche cleaning his windshield. Don’t give up on your unfinished projects – like good wine they are more satisfying with age! 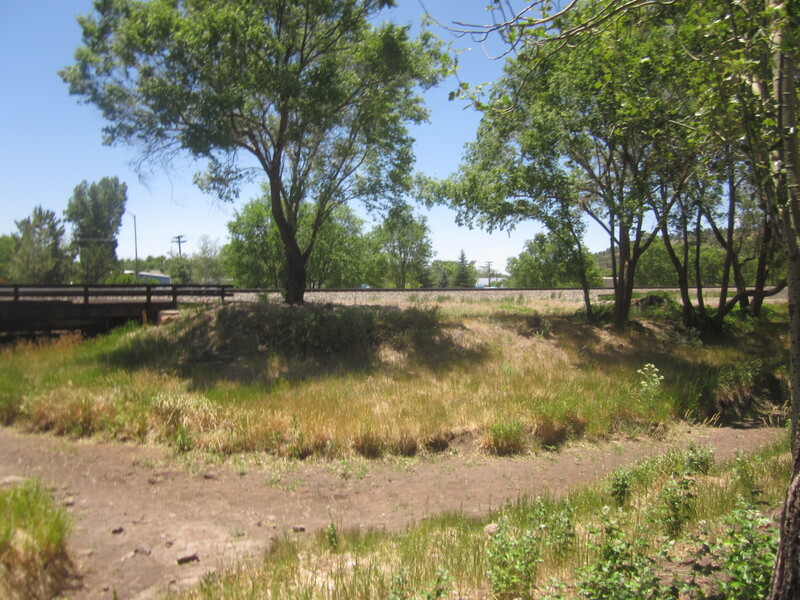 The Superintendent and I were on location last week in preparation for the scenery phase of the Flagstaff Subdivision. 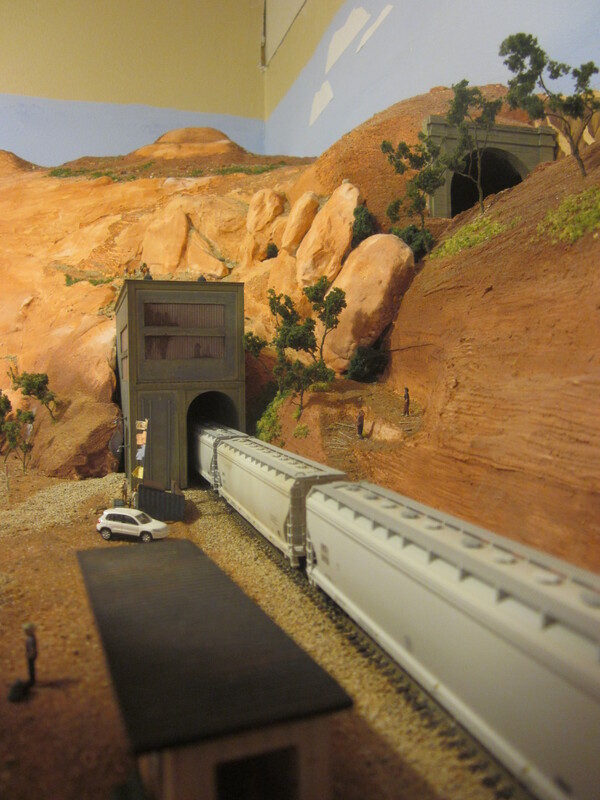 I’m a freelance modeler, so all I really want to do is make the Flagstaff portion of the layout kinda feel like the real thing. I’m not worried about duplicating trackwork or buildings down to the finest detail. Which is good, because when you’re traveling with a six-year-old there’s little exploring and no measuring going on. I got about 45 minutes to take pictures and scoop up some dirt before I was reminded that the real reason we were there was to go to Bearizona just up the road. 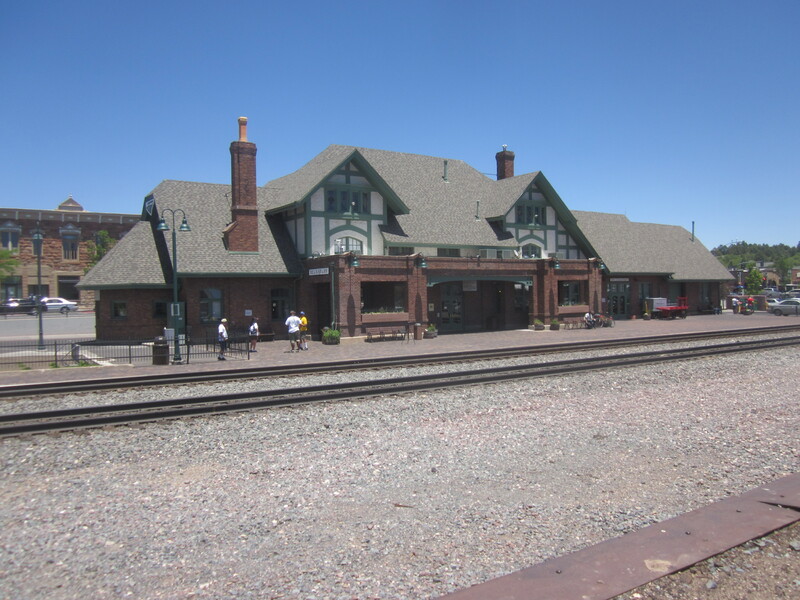 I want to model the depot. It’s an attractive building that will look good with the Many Lost Ways steam shuttle docked out front. I hope I can find a kit to approximate it. Otherwise I’ll build a placeholder while I scratchbuild one, which I will get around to never. About a block away from the depot was this giant collage of road signs. 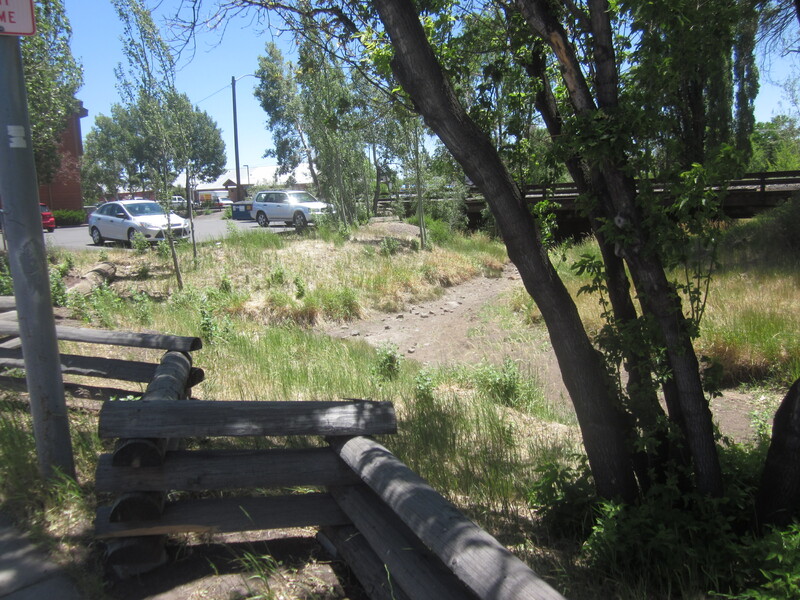 I don’t have much room on the Flagstaff Sub for roads, but this thing is situated on the opposite side of the sidewalk from the road. 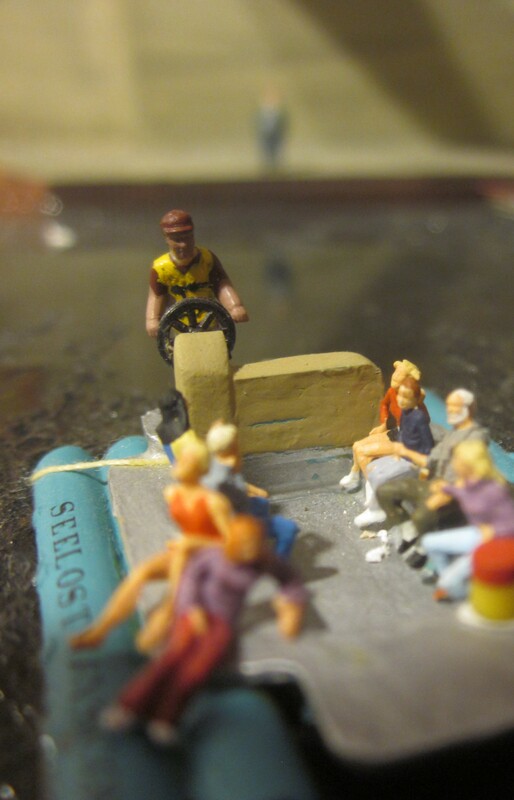 I think I’ll model the sidewalk and curb against the edge of the layout and put the signs between that and the track. That will clearly convey the intended geography to viewers. Okay? 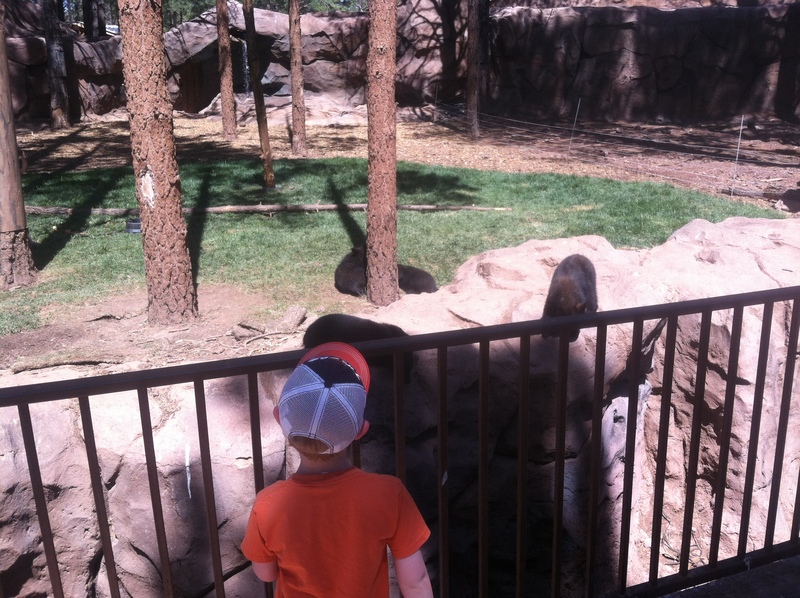 Now let’s go look at some bear cubs before you pee your pants. Outdoor recreation is a big part of the story on the FCFL. Having a few boats being towed around helps convey that. 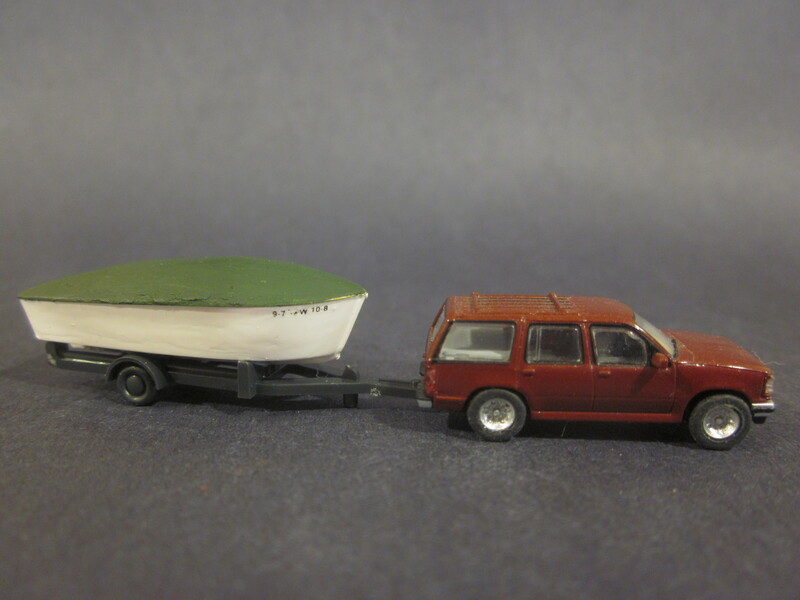 I picked up two sets of Wiking vehicles, including boats on trailers, for my gift layout project. 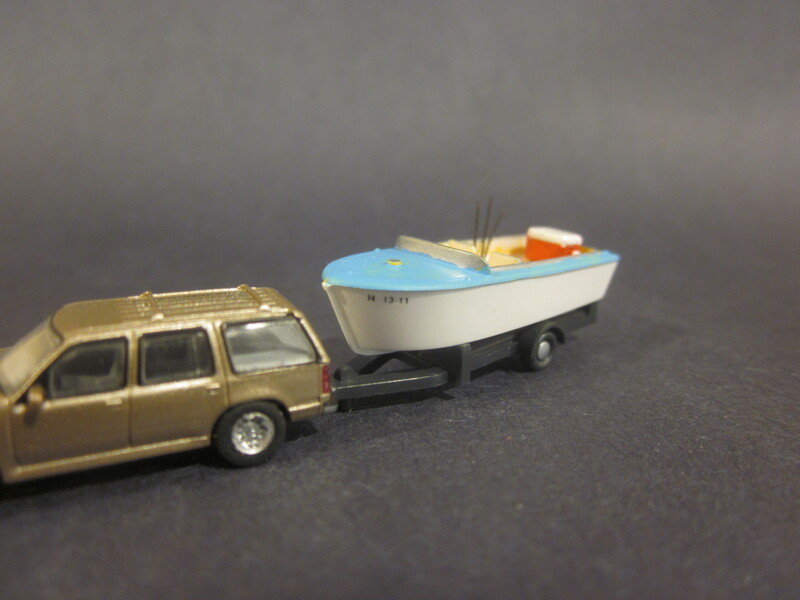 I kept the powerboats and one of the older model Mercedes for myself and added some quick, fun details. I applied some strings of very tiny letters and numbers from an old boxcar decal sheet to the bows of the boats for registration stickers. I didn’t fret over legibility or accuracy. I “tarped” one of the boats by spreading a thick layer of Squadron White Putty over the top of it and sculpting it into “tarp” shape. This took a few rounds of sanding and filling to get the shape and finish I wanted. I painted the tarp a flat dark green. The boats were molded white with yellow interiors. I brushpainted the other boat to add some detail, then added a couple of wire fishing rods and a scratchbuilt styrene cooler. These are both towed by Atlas SUVs. The trailers are good enough – not great – but I think the detail of the boats distracts from them. 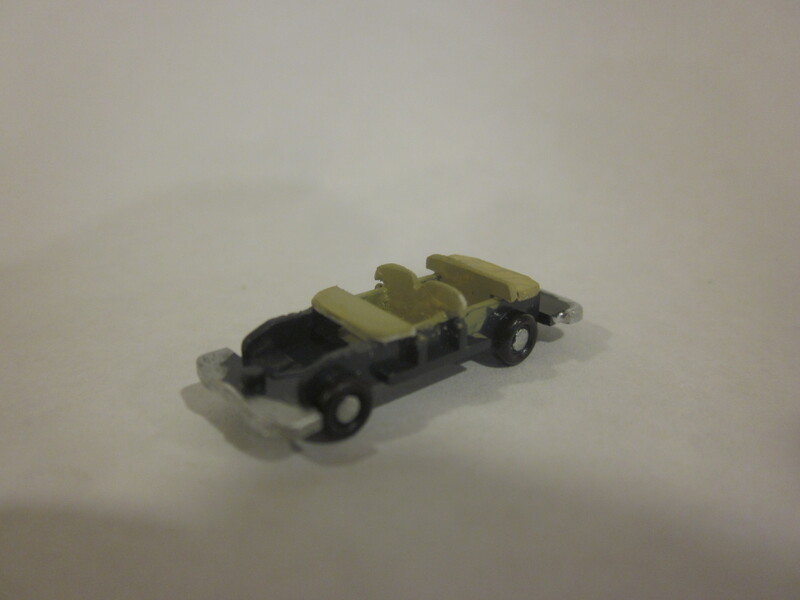 One of the cars from the Wiking set was an older model Mercedes. I made it look more realistic by removing the solid black “window” insert and crafting a basic interior from bits of strip styrene. I painted the interior tan, the bumpers and wheels silver, and the tires rubber brown. The front of the car needed a little definition, so I used a needle file to shape the headlights. I then sprayed the body with a heavy coat of dullcoat. 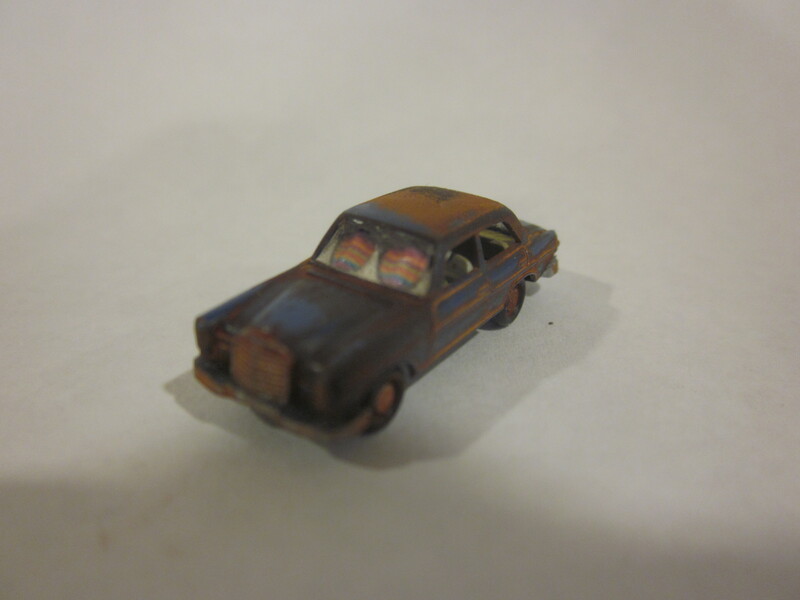 When the dullcoat dried, I gave the body a wash of my rust-colored alcohol ink solution. When the alcohol dries over the dullcoat, the finish looks like badly faded paint over rusty metal. I made a new windshield and rear window from strips cut from the flexible clear plastic insert from a pack of Preiser figures. I glued these in place with CA. I borrowed a whimsical sunglasses image from the Internet and printed it about 3/8 inch wide. I cut it the height of the windshield, then carefully folded it into accordion shape. I then installed it behind the windshield like one of those cardboard sunshades, tacking it in place with a little CA. With the work of a couple evenings, these Wiking vehicles stand out in the traffic on the layout. 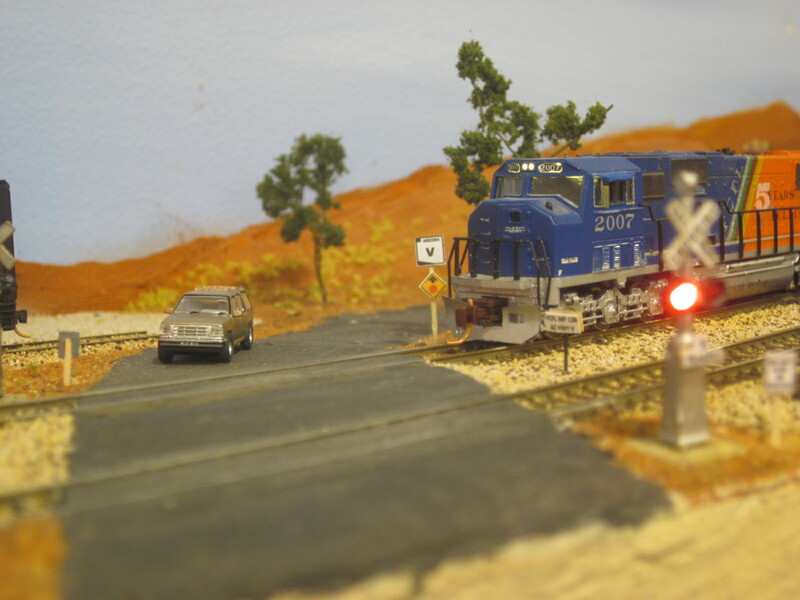 Last week I wrote about the grade crossing with working lights The Superintendent and I added. Electronics are not my thing. Ohm’s law? Amps versus volts? I don’t know what’s watt. The FCFL Four Corners Division traverses sparsely populated areas of the Southwest. Given the long distances between stations with few crossings and relatively little vehicular traffic most of the division operates “dark,” that is without centralized traffic control or automatic block signals. Most of the rural grade crossings are protected by stop signs warning road traffic to watch out for trains. There are two ways to detect trains and actuate grade crossing signals. One is to detect the locomotive current. The other is to use photocells that detect the light change when the train passes over them. 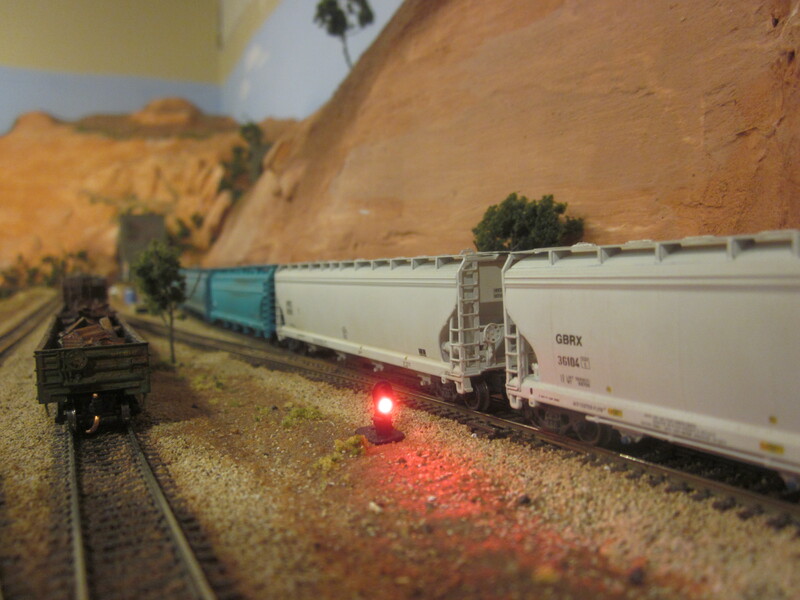 Detecting locomotive current is simpler and doesn’t depend on room lighting for operation. However, the signal operation isn’t prototypical in that a long train may still be in the crossing when the locomotive exits the block and turns off the signals. The photocell system provides more prototypical operation by starting the signals flashing before the train reaches the crossing and turning them off once the train is clear of the crossing. Photocells are mounted between the rails and flush with the ties. When a train passes over the photocells, the grade crossing signals are triggered. 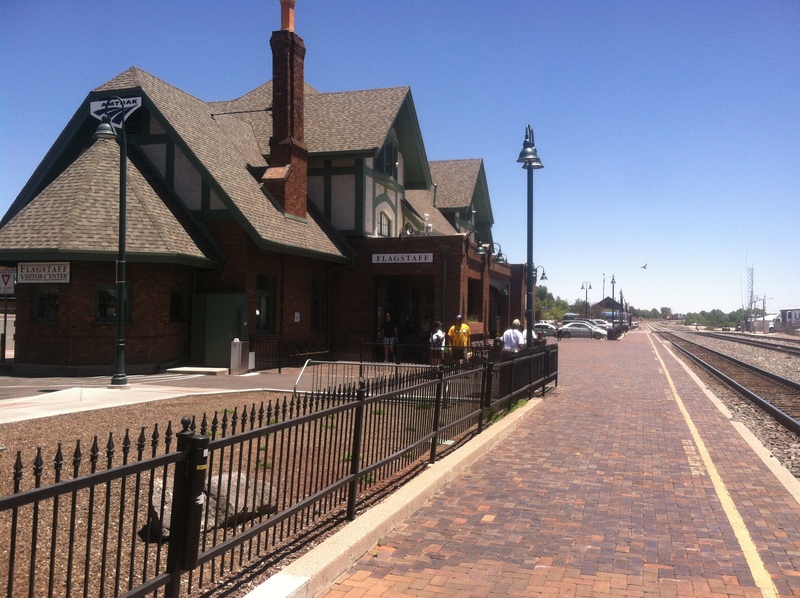 The Logic Rail Technologies Grade Crossing Pro was chosen for this application. The Grade Crossing Pro module uses four photocells, two on each side of the crossing to detect the train, and has outputs to drive the flashing lights as well as an output to drive a switch machine to actuate gates, although gates weren’t installed for this crossing. One complication with this crossing is that there are two tracks and trains can be on either or both tracks at the same time and be moving in either direction. The way to handle this situation is to use two Grade Crossing Pros. One acts as a slave unit that only detects the train on it’s track and sends a signal to the master one to actuate the lights. A DC power supply is needed for these units. A Radio Shack 110 Volt AC to 12 Volt DC “wall wart” power supply was used to power the grade crossing electronics. Between Herbst Junction and the Flagstaff staging area there is a 25-foot stretch of track where the train isn’t visible. This headhouse is the eastern end of a 25-foot tunnel. A block detector was installed to alert operators when a train occupies the unseen trackage. Automatic block signals were installed in this section to provide an indication that the block is occupied. A Circuitron BD-2 Block Occupancy Detector was used to detect the train and drive the signal heads at each end of the block. This is a self-contained unit for one block. It detects the train by sensing the current drawn by the locomotive when it is in the block and has outputs to drive the Occupied/Clear signal aspects. A westbound train enters the tunnel, and the signal head indicates the block is occupied. Twenty-five feet to the west, the train exits the hidden trackage, and the signals show all clear. Beyond the block occupancy detector module, the signal heads, and about 50 scale miles of wire, the only requirement is the Radio Shack 12 volt supply used for the grade crossing signals. There is a small voltage drop in the track power going through the occupancy detector. To compensate, back to back diodes are connected in the power supply to the rest of the layout so there isn’t a sudden change in voltage as the locomotive enters or exits the block. 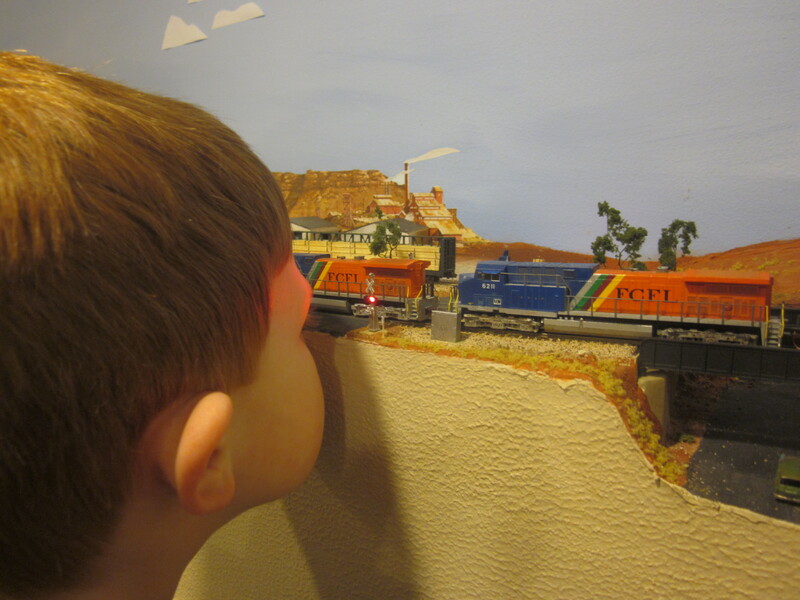 Most model railroaders are familiar with the idea of “forced perspective” – selectively resizing scenery elements to create the illusion of greater distance. I recently modeled a new road, using forced perspective to make it look a little longer than it really is. My partner in the project, The Superintendent, forced my perspective a little, too. 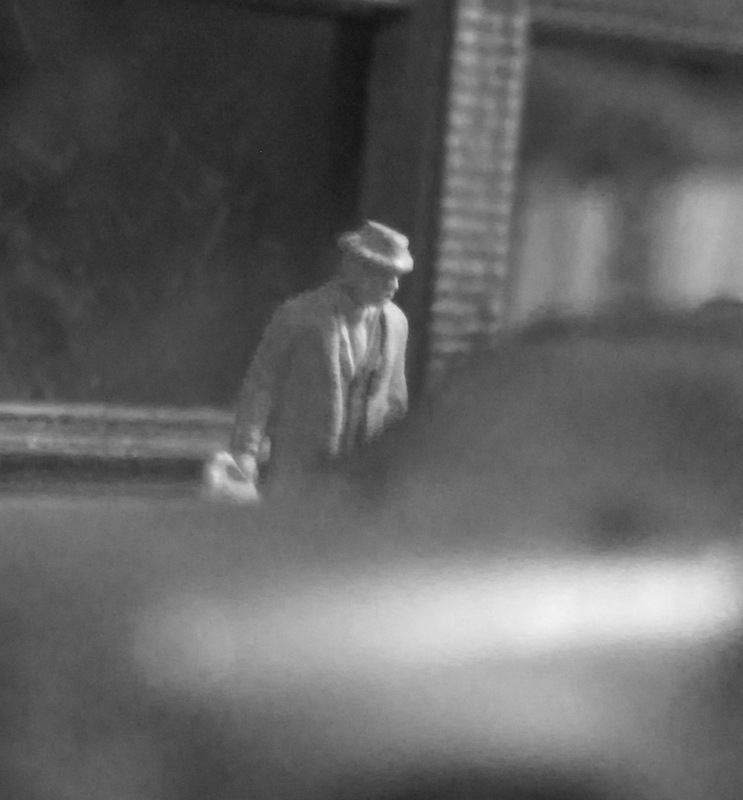 He had some firm ideas about the scene and we disagreed a bit, but seeing it from his perspective made this project special. 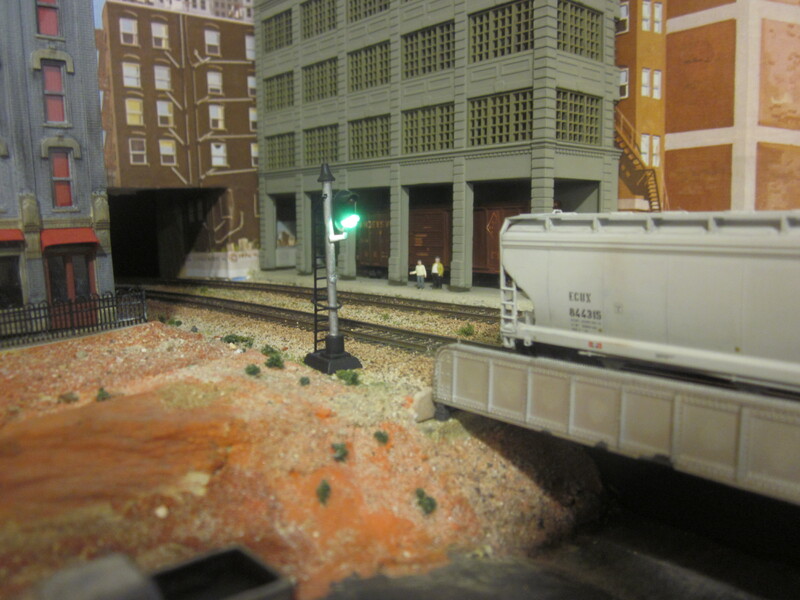 Last fall at a model railroad show, The Superintendent spotted a grade crossing with working lights and gates on an HO-scale module. He insisted on one of our own. I couldn’t shoehorn in the mechanism necessary to actuate the gates, so we compromised on a new stretch of road with a grade crossing and working lights. 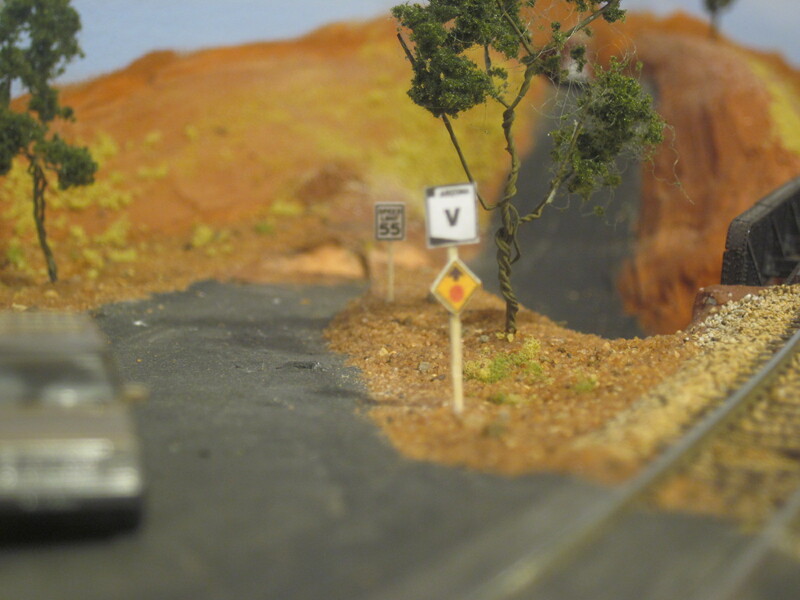 The FCFL is a narrow layout – just 10 inches wide for this scene – so creating convincing roads is a challenge. Just east of Salvation Point, there was an existing rural road with an underpass beneath the mainline. Our new road is a spur from that road. 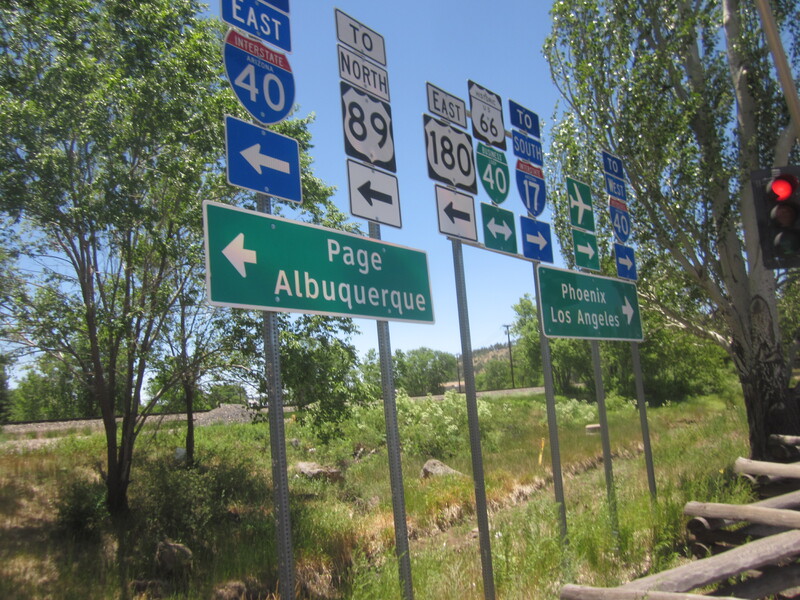 The Superintendent dubbed it Arizona Highway V. Arizona state highways are numbered, not lettered, but what’s that to a six-year-old? “I want it to be Highway V just because I do,” he explained. 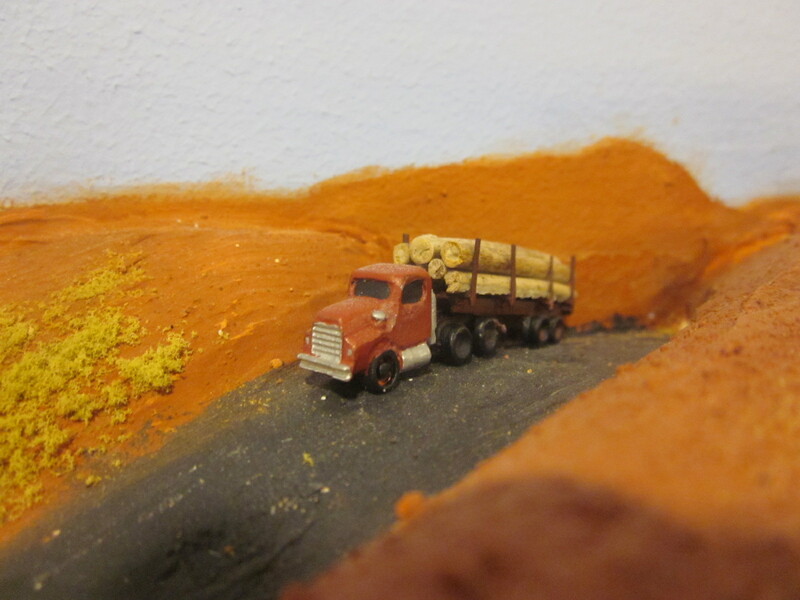 We made Highway V by carving a right-of-way into the scenery, sanding it smooth, and paving it with lightweight spackling compound. 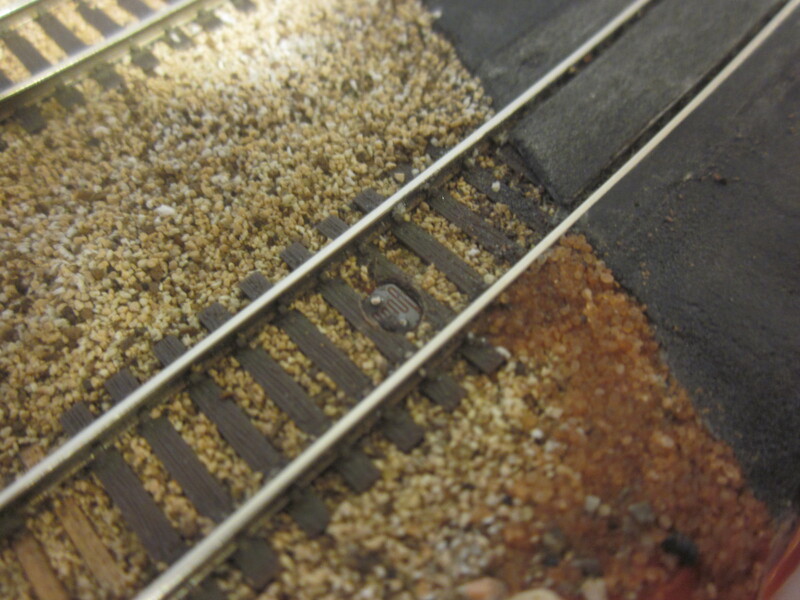 We paved right over the mainline tracks, then immediately cleaned out the flangeways with a toothpick. Once the spackling dried, We sanded it and finished the road with another coat, again clearing the flangeways immediately. 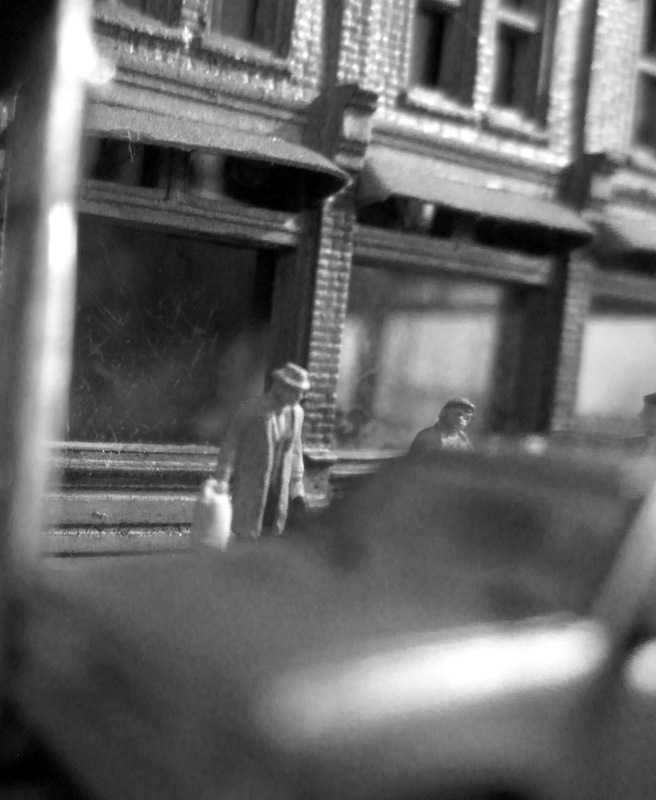 I wanted to model precast concrete panels across the tracks, but The Superintendent insisted on asphalt all around, with no roadway markings of any kind. Fair enough. Unmarked asphalt it is. 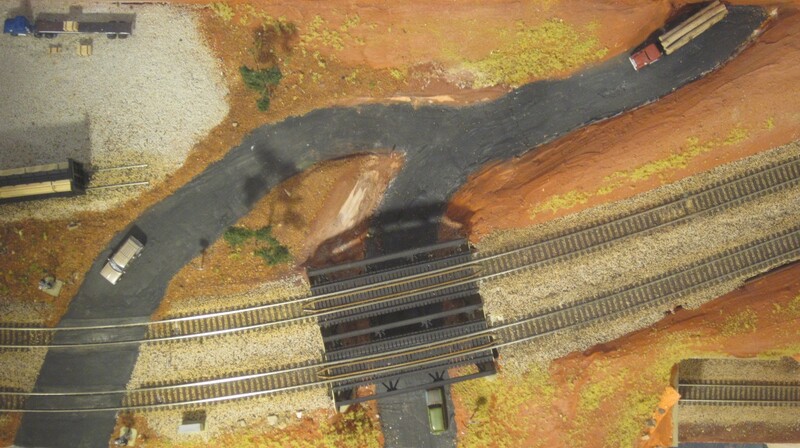 Both the old road and the new road are a scale 28 feet (about 2-1/8 inches) at the front of the layout, and taper to about 1-1/4 inches at the backdrop. This helps fool the eye into thinking the road is longer than it is. We installed two signs along the roadway. 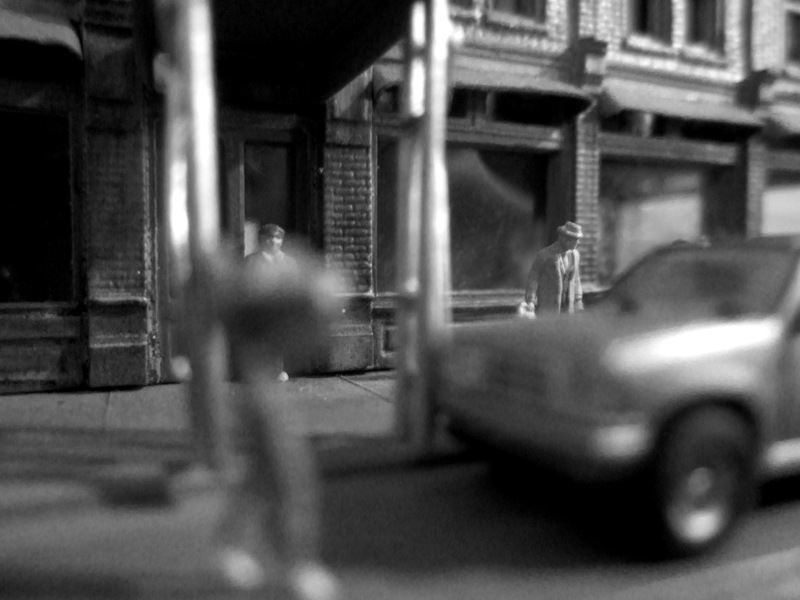 They are a nice detail to the scene, help place the layout geographically, and further aid the forced perspective. The nearest sign is an Arizona highway sign copied from the Internet and modified to show “V”. The highway sign is .2 inches wide – a scale 32 inches. The second is a speed limit sign, which we made .15 inches wide. The speed limit sign is mounted on a shorter post that is half the width of the nearer one. The speed limit sign shows 55 mph. To me this looks like a 35 mph zone. Finally, all the way against the backdrop, is a Z-scale logging truck that I kitbashed from a cast metal container truck. 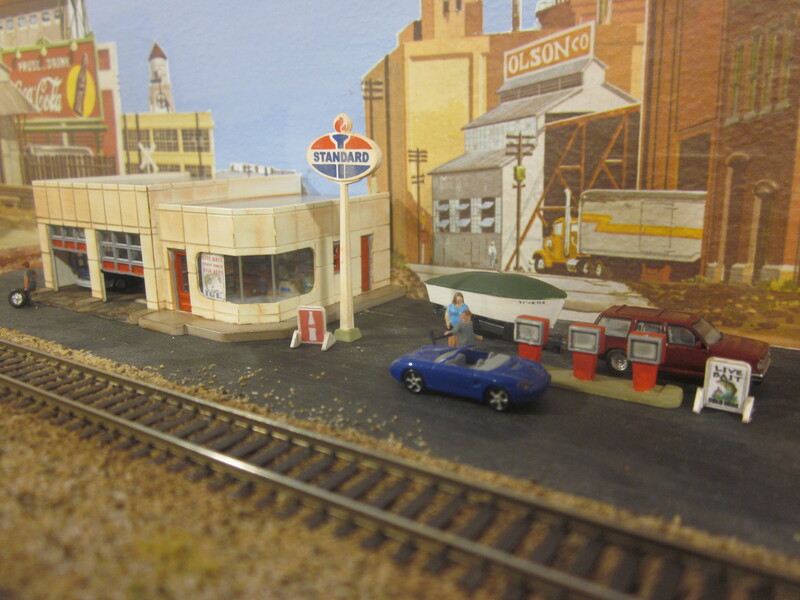 The viewer compares the N-scale SUV up front to the Z-scale truck in back, and the road appears longer again. 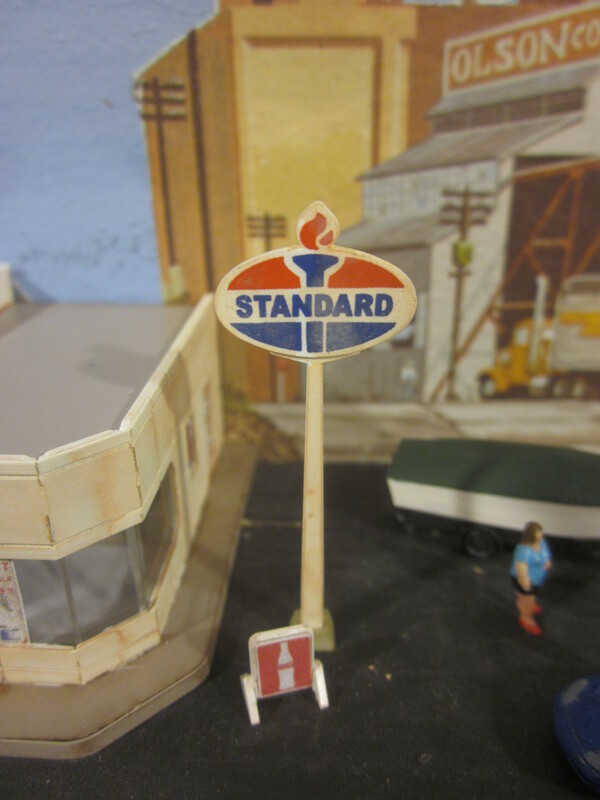 The Superintendent wants a long line of N-scale vehicles waiting for the train, which would ruin the whole illusion. We’re still sorting that one out. This was a fun project. I think we successfully stretched the road using forced perspective, and it was good to stretch my imagination to see things my son’s way, too. Next week – a guest blog from the FCFL’s signals chief (my Dad) about how we make the lights go blinkety-blink.